Caffeic acid (3,4-dihydroxycinnamic acid) is a natural phenolic compound derived from the plant phenylpropanoid pathway. Caffeic acid and its phenethyl ester (CAPE) have attracted increasing attention for their various pharmaceutical properties and health-promoting effects. Nowadays, large-scale production of drugs or drug precursors via microbial approaches provides a promising alternative to chemical synthesis and extraction from plant sources. We first identified that an Escherichia coli native hydroxylase complex previously characterized as the 4-hydroxyphenylacetate 3-hydroxylase (4HPA3H) was able to convert p-coumaric acid to caffeic acid efficiently. This critical enzymatic step catalyzed in plants by a membrane-associated cytochrome P450 enzyme, p-coumarate 3-hydroxylase (C3H), is difficult to be functionally expressed in prokaryotic systems. Moreover, the performances of two tyrosine ammonia lyases (TALs) from Rhodobacter species were compared after overexpression in E. coli. The results indicated that the TAL from R. capsulatus (Rc) possesses higher activity towards both tyrosine and L-dopa. Based on these findings, we further designed a dual pathway leading from tyrosine to caffeic acid consisting of the enzymes 4HPA3H and Rc TAL. This heterologous pathway extended E. coli native tyrosine biosynthesis machinery and was able to produce caffeic acid (12.1 mg/L) in minimal salt medium. Further improvement in production was accomplished by boosting tyrosine biosynthesis in E. coli, which involved the alleviation of tyrosine-induced feedback inhibition and carbon flux redirection. Finally, the titer of caffeic acid reached 50.2 mg/L in shake flasks after 48-hour cultivation. We have successfully established a novel pathway and constructed an E. coli strain for the production of caffeic acid. This work forms a basis for further improvement in production, as well as opens the possibility of microbial synthesis of more complex plant secondary metabolites derived from caffeic acid. In addition, we have identified that TAL is the rate-limiting enzyme in this pathway. Thus, exploration for more active TALs via bio-prospecting and protein engineering approaches is necessary for further improvement of caffeic acid production. Caffeic acid (3,4-dihydroxycinnamic acid) is a natural phenolic compound initially found in plants. Previous studies on its biological activities suggested that caffeic acid possesses anti-oxidant [1, 2], anti-virus , anti-cancer  and anti-inflammatory properties . Moreover, its derivative, caffeic acid phenethyl ester (CAPE), has drawn great attention because of its demonstrated therapeutic effects including its potential as an anti-diabetic and liver-protective agent as well as an anti-tumor drug for human breast cancer treatment [6, 7]. Caffeic acid is one of the pivotal intermediates of plant phenylpropanoid pathway starting from the deamination of phenylalanine which generates cinnamic acid. Followed by a two-step sequential hydroxylation at the 4- and 3- position of the benzyl ring, cinnamic acid is converted into caffeic acid via p-coumaric acid [8, 9]. The involved enzymes, cinnamate 4-hydroxylase (C4H) and p-coumarate 3-hydroxylase (C3H) are plant-specific cytochrome P450 dependent monooxygenases. Due to their instability and membrane-bound property, the purification and characterization of these enzymes are quite challenging, particularly for C3H . It was also suggested that the hydroxylation at the 3-position could also occur after p-coumaric acid is esterified, which does not generate caffeic acid as the intermediate [8, 11]. Recently, genes and enzymes involved in caffeic acid biosynthesis were also reported in the actinomycete Saccharothrix espanaensis. A tyrosine ammonia lyase (TAL) encoded by sam8 and a microbial C3H encoded by sam5 are responsible for the conversion of tyrosine to p-coumaric acid and then to caffeic acid, respectively . Currently, caffeic acid is commonly produced by extraction from plant sources, such as coffee beans. Chemical or enzymatic hydrolysis of caffeoylquinic acid derivatives is also employed to produce caffeic acid [13, 14]. Like many other secondary metabolites, caffeic acid derivatives are usually accumulated at low levels in plants and hence the isolation of these compounds is to some extent difficult and expensive. Microbial conversion provides an alternative approach to caffeic acid production. Sachan et al. reported the co-production of caffeic acid and p-hydroxybenzoic acid in Streptomyces caeruleus by feeding p-coumaric acid . Over decades, advances in metabolic engineering and synthetic biology enable the production of various plant-specific secondary metabolites in recombinant microorganisms [16–19]. Most recently, the conversion of tyrosine to caffeic acid (the titer was not reported) and ferulic acid (7.1 mg/L) in E. coli was achieved by the co-expression of the enzymes encoded by the sam5 and sam8 from S. espanaensis and an O-methyltransferase from Arabidopsis thaliana. However, the above-mentioned studies relied on feeding the direct precursors such as tyrosine and p-coumaric acid, which would increase the production cost and can not be preferred for large-scale production. Alternatively, the development of processes that can enable the biosynthesis of these high-value metabolites from simple carbon sources is much more desirable. By utilizing tyrosine-overproducing strains as hosts, the production of several natural compounds such as L-dopa, flavonoids, and benzylisoquinoline alkaloids from simple carbon sources has already been achieved [21–23]. In this study, we characterized the E. coli native 4-hydroxyphenlacetate 3-hydroxylase (4HPA3H) that was capable of hydroxylating p-coumaric acid and tyrosine in addition to its native substrate 4-hydroxyphenylacetic acid. Moreover, we found the TAL from Rhodobacter capsulatus was able to accept both tyrosine and L-dopa as substrates. Based on these findings, we further designed a novel dual pathway leading from tyrosine to caffeic acid mediated by the enzymes 4HPA3H and TAL. As shown in Figure 1B, native tyrosine biosynthesis can be extended by the introduction of the 4HPA3H and TAL, yielding L-dopa and p-coumaric acid, respectively. Then TAL further converts L-dopa to caffeic acid; while 4HPA3H converts p-coumaric acid into caffeic acid as well. Furthermore, by grafting this dual pathway into E. coli, we successfully achieved de novo biosynthesis of caffeic acid. This work not only opens the route to the production of caffeic acid from simple carbon sources, but also paves the way to the microbial synthesis of many other phenylpropanoids derived from caffeic acid. Proposed caffeic acid biosynthetic pathway. (A) Native tyrosine biosynthetic pathway in E. coli. (B) The artificial dual pathway mediated by 4HPA3H and TAL for caffeic acid biosynthesis from tyrosine. PPS: phosphoenolpyruvate synthase; TKT: transketolase; CM-PDH: chorismate mutase-prephenate dehydrogenase; DAHPS: 3-deoxy-D-arabino- heptulosonate-7-phosphate synthase; 4HPA3H: 4-hydroxyphenylacetate 3-hydroxylase; TAL: tyrosine ammonia lyase; E4P: D-erythrose-4-phosphate; PEP: phosphoenolpyruvate; HPP: 4-hydroxyphenylpyruvate. Plants and bacteria are very different in cell structure, physiology and genetics. One of the difficulties in reconstructing plant pathways in microbial systems is the availability of functional enzymes that are compatible with the specific microorganism. For the biosynthesis of caffeic acid in plants, two cytochrome P450-dependent monooxygenases are involved, which are C4H and C3H . Due to the requirement for anchorage on endoplasmic reticulum, functional expression of these plant P450-dependent enzymes were always problematic in bacterial systems [10, 24]. Fortunately, TALs identified from various sources can catalyze the direct formation of p-coumaric acid from tyrosine bypassing the enzymatic step catalyzed by C4H , and thus, the need for a C4H was not obligatory. Nevertheless, the need for C3H still remains. Although an alternative microbial C3H was identified from S. espanaensis, its activity seems to be low, which limits its applications . One of the most challenging steps in reconstructing plant phenylpropanoid pathway in E. coli is the 3-hydroxylation of p-coumaric acid, because all C3Hs identified in plants are cytochrome P450-dependent monooxygenases and are hard to be functionally expressed in bacterial systems . Therefore, the exploration of alternative enzymes compatible with E. coli is necessary. By examining E. coli native enzymes and pathways related to metabolism of aromatic compounds, we reasoned that the 4HPA3H complex encoded by the operon hpaBC involved in the 4-hydroxyphenylacetate (4-HPA) degradation may play the role of C3H [26, 27]. This enzyme complex can accept a broad range of substrates and has been applied to produce L-dopa and hydroxytyrosol from tyrosine and 4-tyrosol, respectively [23, 26–28]. Because p-coumaric acid is similar to 4-HPA, tyrosine and 4-tyrosol in molecular structure (Figure 2), we reasoned that the catalytic pocket of 4HPA3H should be able to accommodate p-coumaric acid as well. Molecular structures of p -coumaric acid and three known substrates of 4HPA3H. The circles indicate the hydroxylation positions. The boxes indicate the difference of molecular structures. To test this hypothesis, we first cloned hpaBC into a high-copy expression vector pZE12-luc. After over-expressing this enzyme complex in wild type E. coli BW25113, crude extract was prepared for in vitro enzyme assay. Our results indicate that 4HPA3H complex is capable of converting p-coumaric acid to caffeic acid in the presence of flavin adenine dinucleotide (FAD) and nicotinamide adenine dinucleotide hydride (NADH) (Table 1). Its specific activity toward p-coumaric acid (5.37 × 10-3 U/mg protein) is much higher than its activity toward tyrosine (2.44 × 10-3 U/mg protein). One U (unit) is defined as the amount (1 μmole) of product formed per minute. Furthermore, we carried out whole-cell conversion studies which reflect the in vivo enzymatic activity. BW25113 harboring pZE-Ec HpaBC was able to completely convert 100 mg/L p-coumaric acid to caffeic acid within 3 hours after the induction of isopropyl β-D-1- thiogalactopyranoside (IPTG), indicating the in vivo activity toward p-coumaric acid is high. Meanwhile, no caffeic acid was detected in the culture of the control strain (BW25113 harboring pZE12-luc) even after 20 hours. This phenomenon suggested that although hpaBC exists in the genome of E. coli, it is not natively expressed. Thus, over-expression of hpaBC is necessary to obtain adequate 4HPA3H activity. The result of in vivo enzyme assay showed that the highest conversion rates (within the first hour) from tyrosine to L-dopa and from p-coumaric acid to caffeic acid are 112.98 and 240.80 μmol· h-1·gDCW-1, respectively (Figure 3). For both products, we did not observe obvious intracellular accumulation. Both in vitro and in vivo assay results indicate that p-coumaric acid is preferred by 4HPA3H. To our knowledge, this is the first report of the 4HPA3H activity toward p-coumaric acid. In vivo enzyme activity of 4HPA3H complex toward tyrosine and p -coumaric acid. The grey and black bars refer to the amount of caffeic acid and L-dopa, respectively. Previous studies reported that TALs from R. capsulatus (Rc) and R. sphaeroides (Rs) catalyze the deamination of tyrosine . In addition, Rs TAL can also take L-dopa as a substrate . But the activity of Rc TAL toward L-dopa has not been investigated. To evaluate the performance of the two TALs in E. coli, we performed in vitro enzyme assays using crude extracts. The genes encoding the two TALs were cloned and expressed in E. coli using the plasmids pZE-Rc TAL and pZE-Rs TAL. Interestingly, both TALs slightly prefer L-dopa over their native substrate tyrosine. For Rc TAL, the specific activities toward tyrosine and L-dopa were 0.93 × 10-3 and 1.54 × 10-3 U/mg protein, respectively. For Rs TAL, the specific activities are 0.80 × 10-3 and 1.14 × 10-3 U/mg protein, respectively. The results indicated that Rc TAL is slightly more active than Rs TAL toward both substrates (Table 2). As a control, the crude extract of the wild-type E. coli carrying the blank vector did not exhibit any activity. Based on the activities of 4HPA3H and Rc TAL, we proposed a novel dual pathway for caffeic acid biosynthesis from tyrosine (Figure 1B). Because E. coli natively biosynthesizes tyrosine, it is expected that the introduction of Rc TAL and 4HPA3H can result in the biosynthesis of caffeic acid by utilizing E. coli endogenous tyrosine (Figure 1). To achieve this goal, the genes encoding Rc TAL and 4HPA3H were amplified and consecutively cloned into a high-copy-number plasmid pZE12-luc under the control of a strong IPTG-inducible promoter PLlacO1, generating the plasmid pZE-TH. A ribosome binding site (RBS) was placed upstream of each gene. Strain YL-2 was developed by introducing pZE-TH into wild type E. coli strain BW25113 to test this pathway. The production of caffeic acid was carried out in shake flasks using modified M9 minimal salt medium as described in "Methods and Materials". 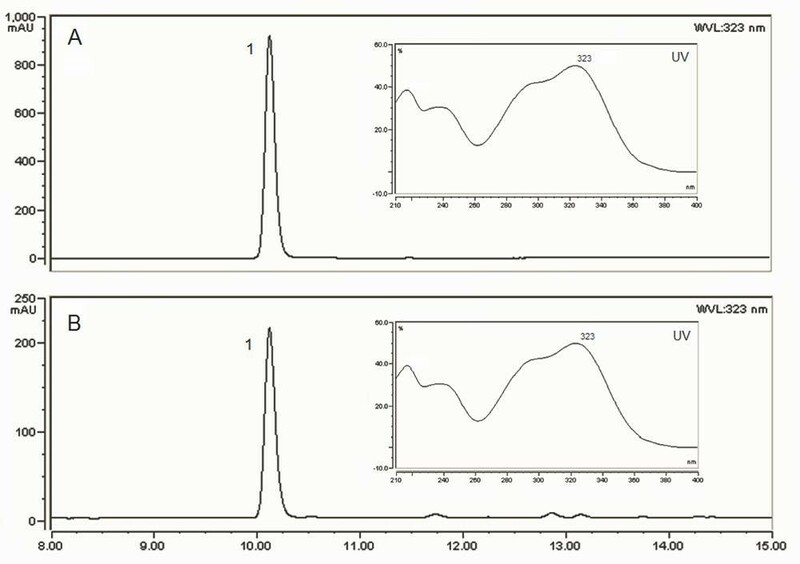 High performance liquid chromatography (HPLC) analysis of the fermentation samples showed that the retention time (10.1 min) and UV profile of the product were identical to those of the caffeic acid standard, confirming that caffeic acid was produced (Figure 4). The strain YL-2 was able to produce 11.1 ± 1.1 mg/L caffeic acid after 24 hours, without obvious accumulation of intermediates including tyrosine, p-coumaric acid and L-dopa. 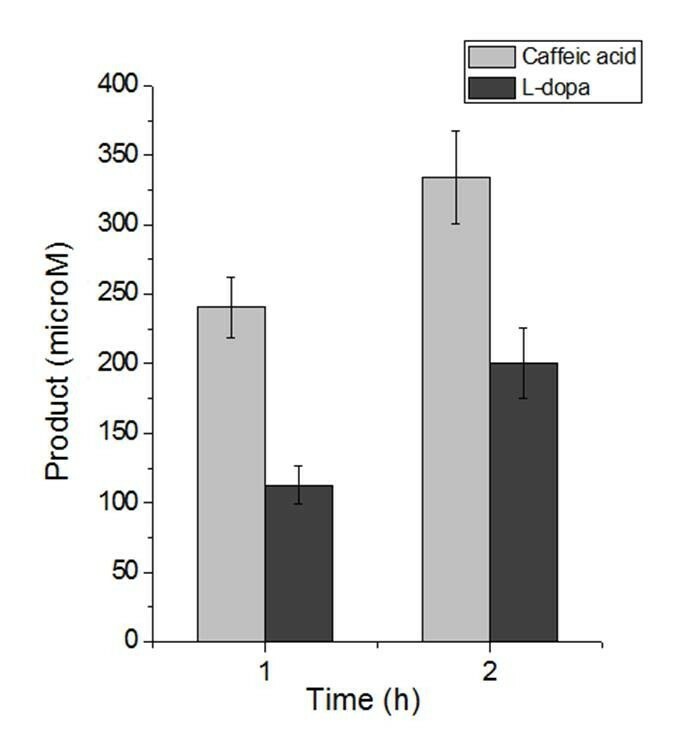 48-hour cultivation did not lead to a great increase in caffeic acid production (12.1 ± 0.3 mg/L) (Table 3). However, L-dopa was accumulated at a concentration of 7.4 ± 0.2 mg/L. HPLC analysis of caffeic acid produced by engineered E. coli (A) Standard, 50 mg/L caffeic acid. (B) A sample taken from the fermentation culture of YL-2 after 24 hours. Peak 1 corresponded to caffeic acid. The retention time was 10.1 min. UV absorbance profiles are shown beside the peaks. 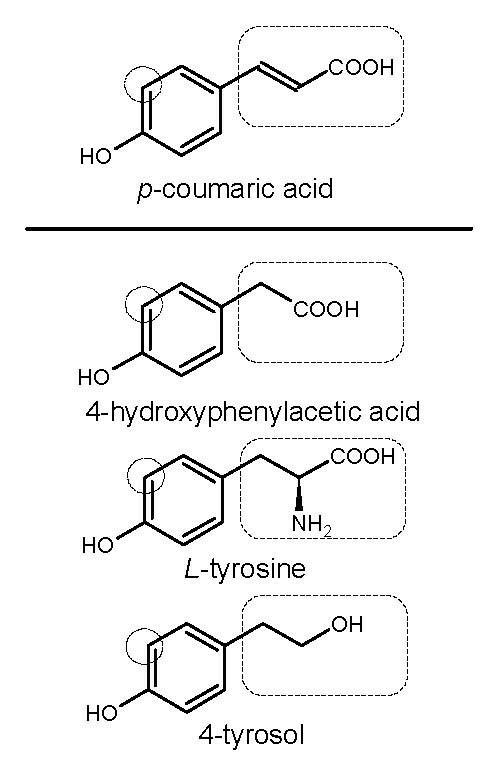 The addition of 100 mg/L tyrosine into the cultures of YL-2 resulted in a two-fold increase in caffeic acid production (Table 3), suggesting that tyrosine is a limiting precursor for caffeic acid biosynthesis. In wild-type E. coli, tyrosine biosynthesis is strictly controlled by several regulatory mechanisms. Two feedback inhibition-sensitive enzymes chorismate mutase-prephenate dehydrogenase (CM-PDH, encoded by tyrA) and 3-deoxy-D-arabino-heptulosonate-7-phosphate synthase (DAHPS, encoded by aroG) were identified as the major regulatory components in the tyrosine pathway . The feedback inhibition resistant (fbr) variants tyrA fbr and aroG fbr have already been developed and applied in tyrosine production [30, 31]. In addition, the availability of erythrose-4-phosphate (E4P) and phosphoenolpyruvate (PEP) is extremely critical to tyrosine biosynthesis (Figure 1A). Over-expression of PEP synthase (PPS, encoded by ppsA) and transketolase (TKT, encoded by tktA) was able to increase the availability of PEP and E4P, and redirect the carbon flux into the tyrosine pathway . In this work, tyrA fbr , ppsA, tktA and aroG fbr were consecutively cloned into a medium-copy-number plasmid pCS27 under the control of PLlacO1 promoter as well, generating the plasmid pCS-TPTA. By introducing pCS-TPTA into wild type E. coli BW25113, we obtained a recombinant strain YL-3. Compared with wild type strain which produced little tyrosine, YL-3 was able to produce 296.6 ± 1.0 mg/L tyrosine in 48 hours, which indicated that over-expression of the four enzymes was effective. Furthermore, the strain YL-1 (ΔtyrR) was also employed as the host to alleviate the tyrR-mediated regulation . The introduction of pCS-TPTA into YL-1 (yielding strain YL-4) resulted in the accumulation of higher amount of tyrosine (426.7 ± 4.9 mg/L in 48 h, Table 3). It should be noted that YL-4 exhibited only slight improvement in tyrosine production compared to YL-3 in the first 24 hours. However, its advantage was demonstrated in the following 24 hours. These results are consistent with what were reported previously [30, 31]. Although YL-4 was able to produce higher amount of tyrosine, this tyrR-deleted strain seemed to be in conflict with pZE-derived plasmids for unknown reasons and did not express the enzymes 4HPA3H and Rc TAL as well as expected. Only a trace amount of caffeic acid (< 0.2 mg/L) and p-coumaric acid (< 1 mg/L) but a large amount of tyrosine (> 400 mg/L) were detected in the YL-6 (YL-1 harboring pZE-TH and pCS-TPTA) cultures. Thus, we employed wild type E. coli BW25113 as the parent strain. By transforming it with both pZE-TH and pCS-TPTA, we generated the strain YL-5. The titer of caffeic acid in the shake flask fermentation using YL-5 reached 50.2 ± 10.1 mg/L after 48 h fermentation which is a 5-fold increase compared to YL-2. Moreover, we analyzed the intermediates accumulated in the culture. The presence of 25.1 ± 2.5 mg/L tyrosine indicated that tyrosine availability is no longer the limiting factor for caffeic acid production in the strain YL-5. The accumulation of a large amount of L-dopa (75.3 ± 13.6 mg/L) and a small amount of coumaric acid (< 0.2 mg/L) suggested that Rc TAL became into the rate-limiting step in this artificial pathway, especially after 24 h (Table 3). We have successfully established a novel pathway and constructed an E. coli strain for the de novo production of caffeic acid via metabolic engineering approaches. We first identifed that 4HPA3H can function as a C3H which exhibited decent activity toward p-coumaric acid and tyrosine, thus gains great potential for metabolic engineering and biocatalysis applications. In addition, we compared the TALs from R. capsulatus (Rc) and R. sphaeroids (Rs) that are able to catalyze the deamination of both tyrosine and L-dopa. RcTAL exhibited higher activities toward both substrates. Then a dual pathway leading from tyrosine to caffeic acid was proposed and introduced into E. coli. The artificial pathway extended the native tyrosine pathway of E. coli and produced 12.1 mg/L of caffeic acid from simple carbon sources. Further improvement of production was accomplished via alleviating feedback inhibition and redirecting carbon flux into tyrosine biosynthesis. Finally, the titer of caffeic acid reached 50.2 mg/L in shake flasks after 48-hour cultivation. The established pathway obviated the use of two cytochrome P450-dependent monooxygenases (C4H and C3H) and achieved the de novo biosynthesis of caffeic acid, which opened the possibility of microbial synthesis of more complex plant secondary metabolites derived from caffeic acid. However, for the production system to be more economically viable, productivity has to be further improved. We have identified that Rc TAL is the rate-limiting enzyme in the pathway once the tyrosine availability issue was solved. To meet the process metrics and avoid the accumulation of the intermediates (tyrosine and L-dopa), we will explore more TALs for higher catalytic activity via bioprospecting and protein engineering approaches. In addition to the tyrosine overproducers we generated in this study, the strains employed to produce tyrosine in amino acid industry are also ready to be used as hosts for caffeic acid production. With proper process optimization, industrially relevant production should be expectable. The following commercially available chemicals and enzymes were used in this study: L-dopa (ACROS Organics); tyrosine (Sigma-Aldrich), caffeic acid (TCI), p-coumaric acid (MP Biochemicals), IPTG (Zymo Research Co.), restriction enzymes (NEB), Hot Start KOD Plus DNA polymerase (EMD Chemicals Inc.), Rapid DNA ligase Kit (Roche). All the enzymes were used according to the instructions provided by the manufacturers. E. coli XL1-Blue (Stratagene) was used for gene cloning and plasmid propagation. Wild type E. coli strain BW25113 (E. coli Genetic Resource Center) and its derivatives were employed for either enzyme assays or shake flask experiments. Plasmids pZE12-luc and pCS27 were used for gene over-expression in E. coli[32, 33]. The characteristics of all the strains and plasmids used in this study are described in Table 4. E. coli cells for gene cloning, plasmid propagation, and inoculum preparation were grown in Luria-Bertani (LB) medium at 37°C. The fermentation medium was modified M9 minimal salt medium containing (per liter): glycerol (10 g), glucose (2.5 g), NH4Cl (1 g), Na2HPO4 (6 g), KH2PO4 (3 g), NaCl (0.5 g), MgSO4·7H2O (2 mmol), CaCl2·2H2O (0.1 mmol), vitamin B1 (2.0 mg), H3BO3 (1.25 mg), NaMoO4·2H2O (0.15 mg), CoCl2·6H2O (0.7 mg), CuSO4·5H2O (0.25 mg), MnCl2·4H2O (1.6 mg), and ZnSO4·7H2O (0.3 mg). For the strains carrying plasmids, 100 μg/ml of ampicillin, 50 μg/ml of kanamycin and/or 30 μg/ml of chloramphenicol were added if necessary. For all shake flask experiments, 200 μl overnight LB culture was inoculated into 10 ml fermentation medium and grown at 37°C with shaking. After OD600 reached 0.4-0.5, IPTG was added into the cultures to a final concentration of 0.2 mM. Then the cultures were transferred to 30°C in a gyratory shaker at 250 rpm. Samples were collected after 24 and 48 hours, and then analyzed by HPLC. General molecular biology techniques and DNA manipulations were carried out according to the standard protocols . Deletion of kanamycin resistant gene from E. coli JW1316-1 was conducted using the method described by Kirill A. Datsenko and Barry L. Wanner . Host cells were transformed with the plasmids by electroporation (EPPENDORF Electroporator 2510, 1.8 kV when using 0.1 cm cuvettes). To construct pZE-Rc TAL and pZE-Rs TAL, the genes encoding Rc TAL and Rs TAL were amplified by high-fidelity polymerase chain reaction (PCR) from the genomic DNAs of Rhodobacter capsulatus and Rhodobacter sphaeroides using the primers listed in Additional file 1: Table S1 . Amplified fragments and pZE12-luc were digested with Kpn I and Sph I, and then ligated with Rapid DNA ligase. To construct pZE-Ec HpaBC, the gene cluster hpaBC was amplified from E. coli MG1655 genome directly. The amplified hpaBC fragment was inserted into pZE12-luc vector between Kpn I and Sph I as well. The pZE-TH was constructed by cloning the gene cluster hpaBC into the pZE-Rc TAL using restriction enzymes Sph I and Xba I. A ribosome binding site is located upstream of each gene to facilitate protein expression. The genes tyrA, aroG, ppsA, and tktA were all amplified from E. coli MG1655 genomic DNA. Point mutations were introduced to tyrA (Met-53-Ile and Ala-354-Val) and aroG (Asp-146-Asn) by splicing and overlapping extension PCR (SOE-PCR), generating tyrA fbr and aroG fbr [36, 37]. The genes tyrA fbr and ppsA were first cloned into pCS27 simultaneously via three-piece ligation using restriction enzymes Kpn I, Nde I, and Sal I, generating the plasmid pCS-TP. Similarly, tktA and aroG fbr were then simultaneously inserted into pCS-TP using restriction enzymes Xho I, Sph I, and Hind III resulting in pCS-TPTA. The E. coli strain BW25113 carrying the plasmid pZE-Ec HpaBC was pre-inoculated into LB liquid medium containing 100 μg/ml of ampicillin and grown at 37°C overnight with shaking at 250 rpm. In the following day, 1 ml of preinoculum was added to 50 ml of fresh LB medium also containing 100 μg/ml of ampicillin. The culture was left to grow at 37°C till OD600 reached 0.6 and then induced with 0.5 mM IPTG. Protein expression was conducted at 30°C for another 3 h. The cells were harvested and resuspended in 2 ml of buffer A (20 mM KH2PO4, pH = 7.0), and then lysed by French Press. The soluble fraction was collected by ultra-centrifugation and used as crude enzyme extract for the enzyme assay. Total protein concentration was estimated using the BCA kit (Pierce Chemicals). The total protein concentration of the crude extract is around 6172 μg/ml. The enzyme activity was assayed according to the protocol described by Tai. et al. with a few modifications . The 1 ml reaction system contained 2 mM NADH, 2 mM FAD, 2 mM substrate (tyrosine or p-coumaric acid) and 100 μl of crude enzyme extract in buffer A. The reaction was incubated at 30°C for 1.5 min and terminated by adding 50 μl HCl (20%) to the 1 ml reaction system. The amount of products (L-dopa and caffeic acid, respectively) were measured and quantified by HPLC. The pre-inoculum of E. coli strain BW25113 carrying pZE-Ec HpaBC from an overnight culture was added in to 10 ml of LB medium (1:100 V/V) and grown at 37°C. IPTG was added to the cultures to a final concentration of 0.5 mM until OD600 reached 0.6. The cultures were left at 30°C for around another 3 hours with shaking for protein expression till OD600 reached 3.0 (approximately equivalent to 1 g/L cell). Then the cells were collected, washed, resuspended in 10 ml of NaCl (0.9%) solution. 1 mM substrate (tyrosine or p-coumaric acid) was added to the cell resuspensions at 30°C. Samples were collected after 1 and 2 hours, and then analyzed by HPLC. The crude enzyme extracts of Rc TAL and Rs TAL were prepared as described before . But the cells were resuspended in buffer B (50 mM, Tris-HCl, pH = 8.5). The 1 ml reaction system contained 2 mM substrate (tyrosine or L-dopa) and 100 μl crude extract in buffer B. The reaction was incubated at 30°C for 1.5 min and the amount of products (p-coumaric acid and caffeic acid, respectively) was measured by HPLC. 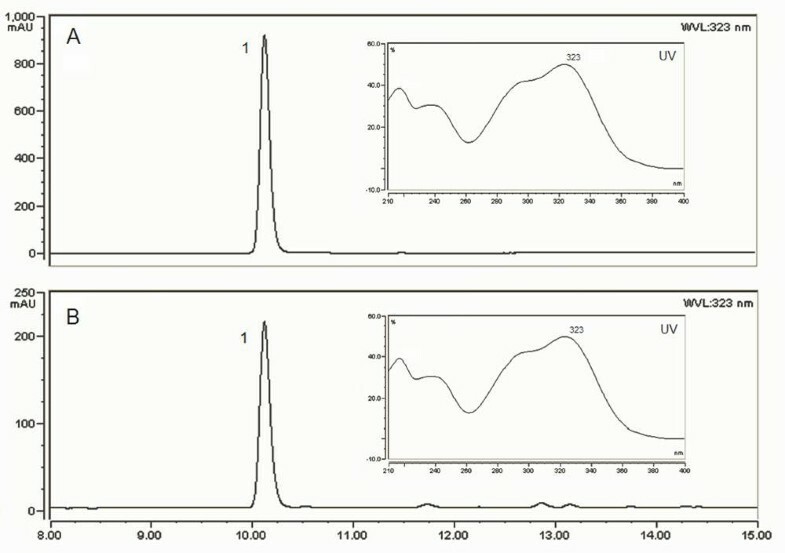 Tyrosine, L-dopa, p-coumaric acid, and caffeic acid generated in enzyme assays and fermentations were quantitatively analyzed by HPLC (Dionex Ultimate 3000) with a reverse-phase ZORBAX SB-C18 column and an Ultimate 3000 Photodiode Array Detector. The compounds were separated by elution with a methanol-water gradient (water containing 0.2% trifluoroacetic acid). The following gradient was used at a flow rate of 1 ml/min: 10 to 50% methanol for 15 min, 50 to 10% methanol for 1 min, and 10% methanol for an additional 4 min. Quantification for the four above-mentioned compounds was based on the peak areas of absorbance at 274, 280, 308 and 323 nm, respectively. The data shown in this study were generated from duplicate or triplicate independent experiments. An erratum to this article is available at http://dx.doi.org/10.1186/s12934-015-0297-2. This work was supported by the start-up funds from the Faculty of Engineering, University of Georgia, Athens and a research grant provided by the University of Georgia Research Foundation, Inc. We would like to thank Rachit Jain for proofreading the manuscript. The University of Georgia has filed a United State provisional patent on this technology. YY and YL conceived the study. YL conducted the experiments under the direction of YY. YL did literature review and drafting of the manuscript. YY made revisions. Both authors read and approved the final manuscript.